Private Enos Fry was a United States Army private as of 1947. He was originally Philip J. Fry's grandfather until Fry's time travel and interference led to his death. Shortly afterwards, Fry impregnated his grandmother, thereby becoming his own grandfather. Enos was a Private First Class stationed at Roswell Army Air Field in 1947 and was engaged to a woman named Mildred. When the Planet Express crew accidentally arrives in July 1947 Roswell, New Mexico, Philip J. Fry realizes his paternal grandparents, Enos and Mildred, worked there. He runs into Enos, and becomes paranoid to keep him alive. Professor Farnsworth had previously told Fry to keep away from Enos to avoid a time paradox, but Fry insisted on following Enos, trying to coax him out of homosexual (or bisexual) fantasies and being overly protective to keep him (and his reproductive organs) alive and well. Fry eventually took Enos to the middle of nowhere, which turned out to be an atomic test site where Enos was killed in a nuclear blast. Fry's horror struck that he just killed his own grandfather and wonders why he still exists. When he returns to comfort Mildred, she seduces him. 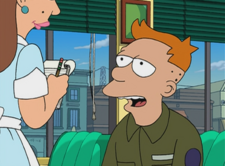 Fry believes that Mildred can't be his grandmother, Professor Farnsworth points out that Fry has become his own grandfather, creating a bootstrap paradox. Despite not actually being related to later Fry generations, they had been led to believe that Enos was in fact, Yancy Fry Sr.'s father. This may possibly be due to Mildred not wanting to admit she slept with anyone other than her fiancé. This list is a list of his would-be family, had his grandson not intervened. Yancy Fry, Sr., original son. Yancy Fry, Jr., original grandson. Philip J. Fry, original grandson. Philip J. Fry, II, original great-grandson. Igner, original distant illegitimate Grandson. Cubert Farnsworth, original descendant's clone. Enos is clearly a parody of Gomer Pyle of The Andy Griffith Show and later—and more related to Enos—of his own spin-off, both in intelligence and speech. His exclamation of "gadzooks" is analogous to Gomer's "shazam". His sergeant is also a parody of Sgt. Carter. In the Italian dub his name is Gavinus and he speaks with Sardinian accent. Although he was originally the father of Yancy Fry Sr., he bears more of a resemblance to Mrs. Fry. Falling on a pile of rusty bayonets, which would have resulted in possible fatal wounds (or tetanus infection). Internal bleeding from eating microchips. Salmonella poisoning from raw chicken. Fry: You almost got neutered! Enos: Well, 'tain't as bad as gettin' killed. Fry: For me it is! Fry: She sure is pretty. You ought to marry her and father some children right away. Enos: Yeah, folks say that, but do you ever get the feelin' you're only going with girls 'cause you're supposed to? Fry: What!? Don't ever, ever say or think that again! Please, just concentrate on staying alive. Fry: That Jeep's gonna hit him! And I won't exist anymore! [Screaming, he runs and pushes Enos out of the way of the slow-moving Jeep, which turns right before it gets to them.] Are you crazy? You almost got yourself run over! Enos: I did? Then I sure am lucky you knocked me onto this pile of rusty bayonets! Sergeant: [shouting] Enos! [Fry gasps and takes Bender's eyes off his head and uses them to zoom in. He sees Enos and a sergeant yelling at him.] Private, I want that toilet bowl so clean I could eat off it! 'Cause I intend to! Enos: Well, thanks, soldier. I'm off to make Sarge's lunch! Handling raw chicken, best part of the job! [He licks his fingers.] Mmm! Finger-licking good! This page was last edited on 5 June 2017, at 07:52.